Nebula, a leading South African telecoms management and innovation firm, has announced the launch of its OneView Lite mobile app. The app provides corporate mobile users with real-time information about their mobile usage and spend. The app is a companion app to Nebula's Telecoms Lifecycle and Expense Management (TEM) cloud system. With the OneView Lite mobile app, it is possible for employees to manage all their company-owned devices, making it easier for them to monitor and control their own spend, reducing wastage such as out-of-bundle costs, and optimising overall telecoms costs in the enterprise. 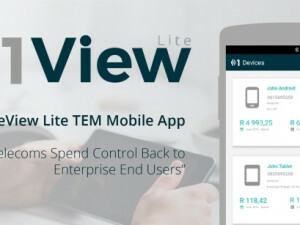 The OneView Lite app is an extension of Nebula's OneView Telecoms Lifecycle and Expense Management (TEM) system offering. OneView is an enterprise-level cloud system, enabling enterprises to manage and monitor the usage, spend and performance over the full telecoms spectrum. It provides advanced analytics, real-time reporting and integration across a multi-service provider environment. Andre Witte, Nebula CTO, says the true benefit of the OneView app is it gives power back to the end-users in the corporate environment, to manage and monitor their own usage and spend, because "previously, the exposed information was only available to the management team and business administrators who are using the system to manage and optimise their enterprise's telecoms environment", says Witte. "The mobile app is for the end-user, for the employee. It puts that power in their hands. Through the app, the user can view the data relevant to his devices and he can see his spend and react accordingly, before it leads to overspend." Users can load all of their company-owned devices onto the OneView app, including mobile phones, tablets and dongles. This enables the employee to view a list of all the devices or SIMs that are assigned to them. Users are able to drill down into each device or SIM and receive real-time information around their bill, package and usage, checking at any time what percentage of their current package has been used, whether it is data or minutes. Nebula OneView Lite TEM App. The app can also be personalised by the user, allowing them to give customisable names and icons to all their devices to more easily distinguish between devices and make it a meaningful experience to the user. In addition to always being able to monitor usage and spend, the app will soon provide real-time alerts, enabling the user to get push notifications when they are approaching their expense or usage limits. By empowering employees to manage and monitor their own device usage, the OneView app provides greater awareness across all levels around reducing and controlling mobile spend. It also gives the company greater control of the entire telecoms environment by empowering the employee and creating usage and spend awareness. In the future, the app will also incorporate the OneView TEM system BYOD and COPE functionality, allowing employees who use personal devices for business purposes, and vice versa, to allocate calls to either personal or business directories. This will streamline the claim process at the end of each month and create convenience for the employee and the business.